It wasn’t a Picasso. It didn’t have to be. In a confusing yet wild and entertaining game, the Rangers defeated the Panthers 5-4 in overtime. Rick Nash’s hat trick allowed them to bounce back from Thursday’s 2-1 defeat in Tampa. His breakout gave the Blueshirts their 10th win in 11 allowing them to stay five points up on the Capitals. Playing about as undisciplined as possible, the Rangers blew a two-goal lead with less than three minutes left in the third period. Earlier, a Mats Zuccarello breakaway goal off a pretty pass from Derek Stepan and a Viktor Stalberg finish from Oscar Lindberg put them ahead 4-2 with 7:46 left. However, they put themselves in penalty trouble all night long. It almost came back to burn them. A bad Stalberg interference minor in the offensive zone allowed Panthers coach Gerard Gallant to risk pulling Roberto Luongo for a 6-on-4 with 3:11 remaining. They made the strategy pay off when Aleksander Barkov rebounded home a Jonathan Huberdeau shot past Henrik Lundqvist with 2:28 left. With Roberto Luongo on the bench for an extra attacker, Jaromir Jagr took full advantage of a Nash turnover tying the score with 1:49 to go. Nash failed to clear the zone leading to a nice passing play with Aaron Ekblad and Barkov combining to find an isolated Jagr for a wicked wrist shot past Lundqvist. 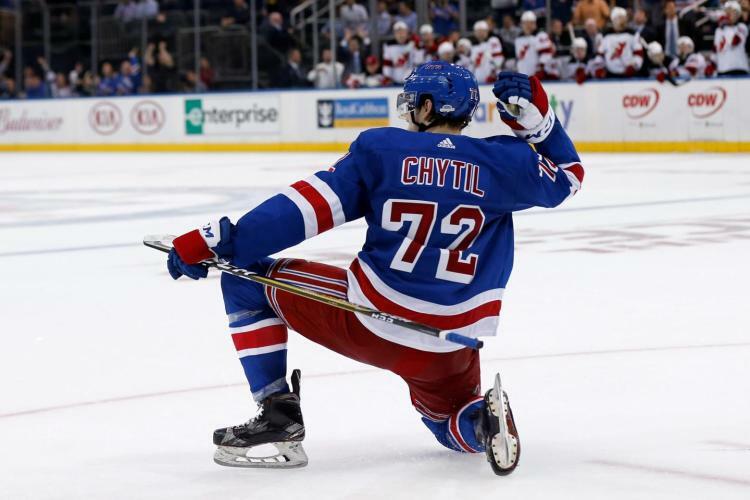 Astonishingly, right off the face-off at center ice, Marc Staal and Dan Boyle allowed Reilly Smith to skate right through and draw a penalty shot with 1:42 left. It was the second penalty shot of the game. Earlier, Chris Kreider failed to beat Luongo in the first. He became the first Ranger to ever earn penalty shots in two consecutive games also doing so but failing against Ben Bishop of the Lightning. Like Kreider, Smith was unable to beat Lundqvist running out of real estate before missing. That allowed the game to go to 3-on-3 overtime. The Rangers have yet to score in it including preseason. That would remain the case due to a bench minor on the Panthers. With the threat of a 2-on-1, a Panther jumped on too soon getting nabbed for too many men. Handed a 4-on-3, the Rangers made it count by getting it to the hot hand. Having already tallied twice including a highlight reel goal where he carried Nick Bjugstad on his back while beating Luongo from a tough angle, Nash was the recipient of a Derick Brassard feed in the right circle. With Zuccarello screening Luongo, Nash fired past the distracted Florida goalie for the game-winner at 2:01 of OT. While the Rangers were celebrating with Nash who scored more goals (3) tonight than his season total (2) entering play, a stoic Gallant stood at the Panthers bench with his stunned team. They seemed upset about something. As it turned out, they were considering challenging whether the Rangers were offside. Zuccarello appeared to be but got back onside when Dan Boyle gained the zone. There was no challenge. Just a Rangers victory. This entry was posted in NYRangers and tagged Dan Boyle, Derek Stepan, Henrik Lundqvist, Jaromír Jágr, Mats Zuccarello, Panthers, Rangers, Rick Nash, Roberto Luongo, Viktor Stalberg. Bookmark the permalink.